“Isn’t it absolute bliss to work with a horse who is totally relaxed? A horse who is in tune with his environment, and able to handle it? A horse who is attentive and relaxed, whose company you can enjoy even more because you can skip worries or fears? 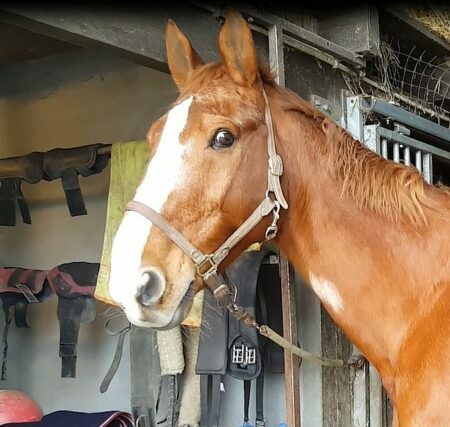 Socialising your horse so he is able to face tasks and challenges in our human world without fear and with confidence is of the utmost importance. It has a direct link to wellbeing, to the way you work together, to how he learns, and to how he remembers the things you teach him. And although handlers and riders do see the importance of a horse being in a relaxed and healthy mental state, this is not always the way it works out in real life.” The person talking is Rachaël Draaisma. Three years ago, she started a study on the calming signals of domestic horses. Under the mentorship of Turid Rugaas, Rachaël analysed over two hundred films. The aim was to investigate the calming signals of domestic horses, but in time the study grew, and other language signs were included to do justice to the various communication signals horses give. Communication ladders were made that grouped various signals to give more insight. “Handlers and riders do not often notice, or give meaning to the signals a horse gives when he experiences light tension,” Rachaël continues. 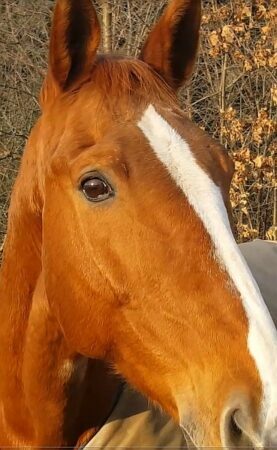 “The possible facial features of the horse that indicate light stress can also be conceived as the horse’s normal face. This is very often the case when the light tension of the horse does not lead to direct problems for handlers and riders. The horse may give signals, and although these are not observed or addressed, the tension of the horse does not increase, and thus the horse is able to get through the situation with continuously light tension, or decreasing tension. Problems might arise, however, when the signs that a horse gives when experiencing light tension are not noticed or addressed and are followed by increased stress and signals such as whinnying, scraping the front leg, a trembling front leg, pacing, an intention to bite, or weak or strong attempts to flee. Now, not noticing is not an option anymore. The horse is showing strong signals which are both clearer and have more impact on the rider and handler. “The map of the signals a horse shows when he experiences rising or declining tension is one of the most valuable tools that came out of my study. By analysing film material, image by image, I could group signals that belong together. These groups of signals represent the tension level the horse experiences. I have designed several tiers of these in the form of ladders, in which signals and tension levels are combined. The ladders reflect situations you and your horse might experience in real life. The communication ladders are helpful when analysing signals your horse might give in certain situations. There is no need to explain why it is much more effective to recognise language signs before tension escalates, and this is when calming signals come into the picture.